Benjamin Birkinbine, a doctoral student at School of Journalism & Communication of the University of Oregon, will be awarded IAMCR's 2014 Dallas Smythe Award for his paper "Incorporating the Commons: Towards a Political Economy of Corporate Involvement in Free and Open Source Software". Birkinbine’s paper analyses the case of free software and the commons. It traces the complicated power negotiation process between the media institution/corporation, Oracle, and audience commodity/free software users, the FLOSS community. The paper reflects a solid approach in political economy of communication and problematizes the strategy of digital labor resistance (or unpaid labor resistance) within the context of a disperse geographic community. The members of the selection committee were Rodrigo Gomez (Universidad Autónoma Metropolitana-Cuajimalpa, Mexico) Peichi Chung (Chinese University of Hong Kong) and Daniel Biltereyst (Ghent University, Belgium). The committee concluded that the paper offers an excellent analysis of a subject that is of crucial empirical and theoretical significance to the field of media and communication research. Media and communication scholars have important social implications to study and explain the activities of people who struggle to change unequal social and economic structures. Ben Birkinbine's paper is a well-organized, clearly written and detailed case study of the FLOSS community and its exploration of a new path of resistance in the software and information industries. The selection committee noted the overall high quality of papers received and thanked all participants for their interest in the award. 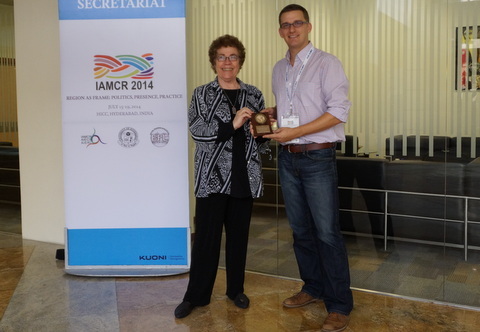 Ben Birbinkine will receive the award at a ceremony during IAMCR's 2014 conference in Hyderabad, India. Free (libre) and open source software (FLOSS) gives users the right to study, modify, adapt, or improve upon software by granting access to the source code. Proprietary software, on the other hand, relies on restricting certain uses of software to protect the marketability of intellectual property. From its beginnings in the 1980s, FLOSS has provided a radical alternative to proprietary software and is generally heralded as one of the triumphs of commons-based peer production. However, corporations are becoming increasingly involved in FLOSS projects, which would seem to be a contradiction of interests. In this paper, I argue that the increasing corporate involvement in FLOSS projects offers a potential threat to derail the radical potential of FLOSS by directing commons-based development toward corporate goals. To date, the FLOSS community has been able to leverage its collective labor power to counteract such corporate maneuvering. This type of collective action relies on a class consciousness among software laborers that needs to be maintained if these strategies are to remain effective. To illustrate how these dynamics operate within the software industry, I focus on the acquisition of Sun Microsystems by Oracle and its consequences for FLOSS development. Born in Canada in 1907, Professor Dallas Smythe was a founder of the field of political economy of communication and a leading scholar who had significant influence in American and international communication policy. Trained as an economist, Smythe's professional career included appointments at the Department of Agriculture, the Department of Labor and the Federal Communication Commission in the United States and the University of Illinois. His professional work and social engagement eventually caused him problems and during the McCarthy period he found it difficult to get articles published or to get money to fund research. In 1963 he returned to Canada, where he worked at the University of Saskatchewan and later at Simon Fraser University, where he was Professor of Communication from 1976 until his death in 1992. Dallas Smythe was an active member of IAMCR. He established the Communication Satellites Section, which later became the Communication Policy & Technology Section, and was an active participant in the Political Economy Section.